So, this bodes well, doesn’t it? I’ve had various half-ideas for this week’s post, but almost all of them seemed ridiculously cheesy. Either that, or they were vaguely spiritual thoughts with tenuous links to what’s going on in the news. So here we are, with this vaguely waffling “meta post” about how I’ve nothing to post. You’re gripped, I can tell. Still, having nothing to say isn’t necessarily a bad thing. Ronan Keating sang about how “you say it best when you say nothing at all”. Jon Stewart, the former host of US satirical news programme The Daily Show spoke powerfully when apologising for having “no jokes” in the wake of the Charleston church shooting in 2015 (contains bleeped-out swearing, but you should still watch it). Think of Job & his mates. As someone on a forum I was reading pointed out, they were doing really well until chapter 4! Then they decided to open their mouths and… well it all went wrong from there. Then Job himself is told off by God (!) for speaking out of turn (before being praised by God for speaking right… I know, I know… just stick with me here). Are there times when it’s better not to say anything? Y’know, when someone says something because they think they ought to because they can’t bare the silence and it’s the most ill-considered, pointless thing you ever heard? One of my favourite books on preaching is “A Reader on Preaching”. And one of my favourite articles in it is called “Preaching and Silence” by John Killinger. 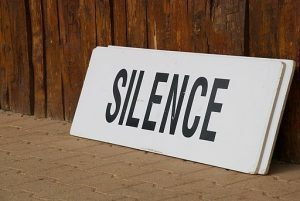 Killinger argues that one thing that is utterly essential for preaching is silence. Which sounds weird, considering preaching seems to be all about speaking, about words, about verbiage. And some ministers are very good at speaking, at words, at verbiage (tum-te-tum…). But Killinger’s point is this: to be truly worthwhile and significant, those words have to be formed in silence. Silence gives them weight and meaning, silence makes speaking, at least Godly, worthwhile speaking, possible. About a year ago, we changed the format of our prayer meetings at Greenfield to having an open time of prayer, which is left quiet for people to pray quietly or out loud as they choose. I must confess that at first, when barely anyone prayed out loud apart form the people who always pray out loud, I was frustrated. But then one of our Deacons pointed out how glad they were that people felt comfortable just being quiet in prayer. Which pulled me up short and made me realise what a special thing that silence was. But I’m babbling on now, saying something when perhaps nothing more needs to be said. As Clement Atlee almost said: a period of silence on my part would perhaps be most welcome. For now, at least.